MORRISTOWN, NJ - Through a partnership with Investors Foundation in Short Hills, NJ, the New Jersey Theatre Alliance (“the Alliance”) has released two videos to complement the poster displays and theatre locator maps available in each of its 33 member theatres. Its See Professional Theatre campaign showcases the benefits of enjoying local theatre productions performed and produced by theatre professionals in the Garden State. The campaign brings to light the vast professional talent being showcased throughout New Jersey. The four-video series, by videographer Dave Tavani, captures the exciting and unique elements of live theatre made in New Jersey. It is designed to not only encourage visitors to visit a new theatre company but to emphasize the excellence and affordability of professional theatre in New Jersey through feedback from theatre patrons. The “Magic of Live Theatre” launched the series in December. The second video, which examines how Alliance member theatres tackle pressing social issues, was released on Martin Luther King, Jr. Day. You can learn more about the campaign at njta.org/SeeProTheatre and view the series on all of the Alliance’s social channels at @njtheatre. The videos will also be distributed by Alliance member theatres. 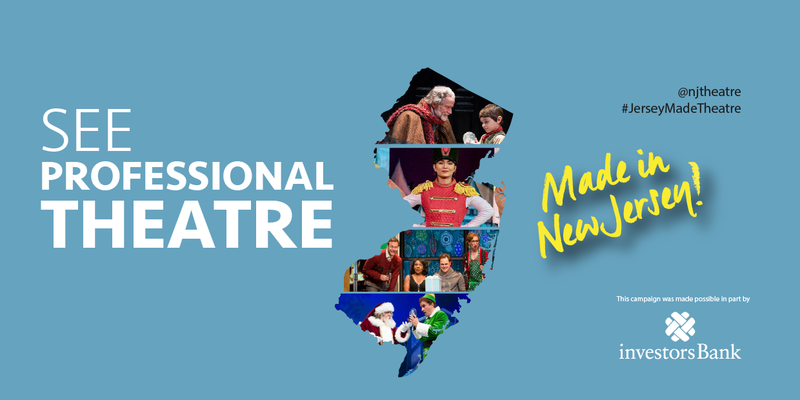 A unique hashtag, #JerseyMadeTheatre, enhances the See Professional Theatre campaign presence on social media and underscores the variety, accessibility, diversity and high quality of its 33 professional member theatres throughout the state. Visit the Alliance website, njtheatrealliance.org, to learn more about professional theatre in New Jersey. Alliance member theatres include these Equity Producing Theatres: American Theater Group in South Orange, Cape May Stage in Cape May, Centenary Stage Company in Hackettstown, Crossroads Theatre Company in New Brunswick, Dreamcatcher Repertory Theatre in Summit, Eagle Theatre in Hammonton, East Lynne Theater Company in Cape May, The Garage Theatre Group in Teaneck, George Street Playhouse in New Brunswick, The Growing Stage: The Children’s Theatre of New Jersey in Netcong, Luna Stage Company in West Orange, McCarter Theatre Center in Princeton, New Jersey Repertory Company in Long Branch, Paper Mill Playhouse in Millburn, Passage Theatre Company in Trenton, Premiere Stages at Kean University in Union Pushcart Players in Verona, The Shakespeare Theatre of New Jersey in Madison, Surflight Theatre in Beach Haven, Two River Theater in Red Bank, and Writers Theatre of New Jersey in Madison. Associate Theatres include: Actors Shakespeare Company in Hoboken, Alliance Repertory Theatre Company in Summit, Art House Productions in Jersey City, The Company Theatre Group in Hackensack, Hudson Theatre Works in Weehawken, Midtown Direct Rep in Maplewood, Mile Square Theatre in Hoboken, Skyline Theatre Company in Fair Lawn, South Camden Theatre Company in Camden, Speranza Theatre Company in Jersey City, The Theater Project in Maplewood, and Women’s Theater Company in Lake Hiawatha. Investors Bank, headquartered in Short Hills, New Jersey, is a full-service community bank that has been serving customers since 1926. With over $25 billion in assets and a network of more than 150 retail branches, Investors Bank delivers personalized services and products tailored to the needs of its customers. Investors Bank’s services include complete deposit, loan and cash management products for consumers and businesses. Investors Bank. Member FDIC and Equal Housing Lender. Investors Bank created the Investors Foundation in 2005 to support the communities Investors Bank serves. The Investors Foundation supports initiatives in the arts, youth development, health and human services, education and affordable housing. The Investors Foundation works to improve the lives of its customers and neighbors.